If you’re a clinician, you know that closed loop medication administration can enhance patient safety and improve efficiencies throughout the medication management process — from the time a physician orders a prescription, to the time a nurse administers the medication and documents it in the patient’s eMAR. Maybe you’ve implemented CPOE and bedside medication verification to close the loop on oral medications? But what about IV meds? Exactly what does closed loop IV medication administration look like? Union Hospital in Dover, Ohio, recently connected their IV smart pumps with MEDITECH, closing the loop on IV medication administration. Their LIVE date was June 7, 2017. We worked with Union to create these great “Before and After” visual illustrations of their workflow processes. Take a look at the first illustration below. You can see that it’s not a closed loop process — there are gaps where some of the pieces were missing. The workflow started when the physician ordered the medication. 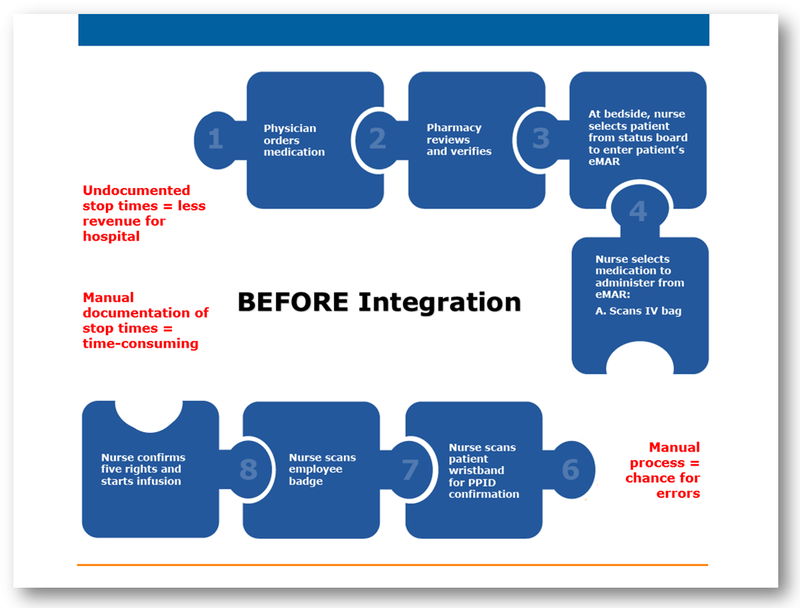 At Union Hospital, this happened via CPOE to maximize patient safety. Then, Pharmacy reviewed and verified the electronic order, after which it moved to the bedside to be administered. Your hospital’s steps #4 - #7 may or may not look exactly like the ones below. For example, you may not scan everything that’s listed. The key thing to remember in steps #4 - #7 is that before June 7th, the IV medication order itself didn’t pass electronically from Union Hospital’s computer system to the patient’s pump, leaving a hole in the bottom right corner. Before June 7th, nurses manually programmed all of the IV order details into the smart pump. That manual step broke the closed loop. If you’re a clinician, you know that particular hole leaves a huge opportunity for human error, where adverse events can occur. In the upper left corner of the puzzle, there are more holes. After the infusion finished, the details from Union’s smart pumps had to be manually keyed into MEDITECH by the nurse. Prior to June 7th, that manual documentation often didn't take place because it's a time-consuming and inconvenient process. To make matters worse, undocumented stop times resulted in lower reimbursements for Union Hospital. In step #9, the smart pump sends infusion data (start time, stop time, actual volume infused, etc.) to Accelero Connect. And to close the loop completely, Accelero Connect files that infusion data into the appropriate fields in MEDITECH (these fields, too, may vary from hospital to hospital, depending on platform and the customizable fields each hospital has created). Steps #9 and #10 collectively are known as Auto-Documentation. Auto-Documentation results in accurate, complete documentation and can help hospitals improve revenue. At most hospitals today, IV-related adverse events remain a significant issue. In fact, the ECRI Institute identified infusion errors as the #1 issue in its report, Top Health Technology Hazards for 2017. 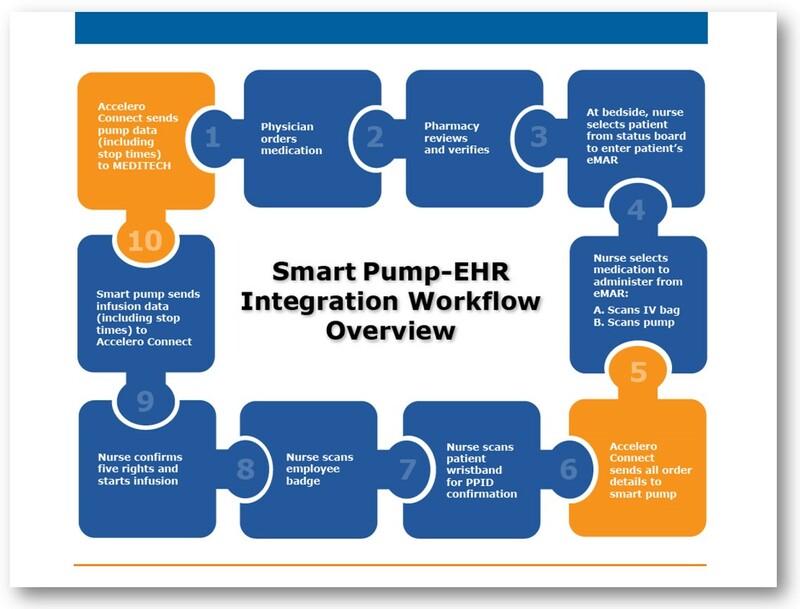 With such potential for improved patient safety, time savings for nurses, and increased revenue, Smart Pump EHR Integration should be near the top of every hospital’s interoperability priority list. Subscribe to the Interoperability and HIE blog. Receive the latest articles directly in your inbox.